Sterling Essentials Leather care products contain a special blend of natural food-grade products, and therapeutic grade essential oils. This ensures that your leather is nourished and protected while still being gentle on you and on your horse. The conditioner provides a natural barrier to protect against water damage, mold, and mildew, keeping leather in mint condition year round. Additionally, Sterling’s cleaner is specially formulated to match the pH of leather in order to prevent deterioration, keeping your valued saddles, footwear, furniture, and other leather goods healthy and happy. Both the leather cleaner and the leather conditioner are offered in several different delightful aromatherapy-like fragrances. ensures your leather is nourished and protected. gentle on you and your horse on contact. Both the leather cleaner and conditioner are offered in several different fragrances. Quality leather tack is certainly one of the bigger investments we make as part of our time with horses. One of the best ways to protect your leather tack and your investment is to ensure that you care for your leather using products that support the natural pH of the leather. 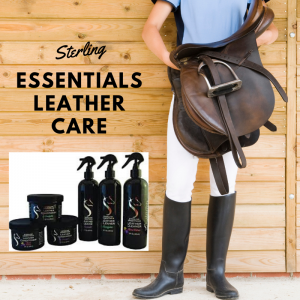 Sterling Essentials Leather Care makes sure your investment in tack is protected. We only utilize gentle ingredients and special blends of non-irritating food-grade materials and therapeutic grade essential oils in order to ensure that you don’t have to worry one bit about what products are touching you or your horse. No harsh chemicals here, you can trust that all is safe for your animal when using Sterling Essentials Leather Care. Ocala Breeder’s Feed and Supply carries a full line of sponges and tack cleaning cloths to ensure your cleaning and conditioning products can be applied properly.